"Scene In A Mall"/"The Reigning Lorelai"
Obviously, the casting and chemistry of Lauren Graham and Alexis Bledel (in addition to Scott Patterson) is what makes Gilmore Girls Gilmore Girls. But the importance of Kelly Bishop can never be overstated, and episodes like these two show how much it’s easy to take her for granted. Week in, week out, Emily never falters with her disapproving glances and cutting remarks to our Lorelai—even as she tosses off one-liners like saying that Richard’s mustache makes him look like Adolphe Menjou’s coke dealer last week, so that we know that Lorelai’s own witty apple did not fall far from that particular tree. Also, as upsetting as it is to have the base of the Gilmore family unravel this season, it’s an arc that is pulled off with careful consideration and forethought, stretching all the way back to the Yale game and the reveal of Richard’s annual lunches with Pennilynn Lott. Richard’s business alignment with Jason has separated him even further from his more traditional standards, and now Emily, after decades of a stable domestic life full of fundraising and lunches, finds herself adrift. The first meltdown comes in the midst of “Scene In A Mall,” when she has a breakdown over her impending mid-life crisis in the middle of a posh store. It’s a vital counterpart to Rory and Lorelai’s similar breakdowns the week before: They both had a (male) friend to fall apart on: Emily has her daughter and granddaughter to help here to regroup at the food court. But as we see over these few weeks, moments of crisis occur no matter what stage of life you happen to be in. Beforehand though, it is breathtaking to see Emily order various shoppeople around. Afterward, it’s almost as gratifying to see her enjoy some unfamiliar fried food (“I had no idea so many foods came on sticks”), even moreso to see her actually compliment her daughter on her business acumen, surprised when Lorelai offers that she learned from the best. It’s a fascinating portrait: A woman like Emily, raised to marry well and likely in college just for her MRS degree, could have been an incredible force in the business world in anything she put her mind to. Instead, she’s stuck in the Hartford, Connecticut social rat race, and begins to suspect that it’s not all that it’s cracked up to be. It’s another arc that’s nice to watch from considerable distance, knowing how happily she ends up at the end of the revival, but for now, Emily’s distress aptly displays the magnificence that is Kelly Bishop. As she whirls around the mall, barking orders and spending money, we are as breathless as Lorelai and Rory to try to keep up with her, knowing full well that there’s no way that we can. That magnificence somehow only intensifies in the very next episode, when, after discovering that Trix begged her son not to marry her, Emily gives up on everything all together. 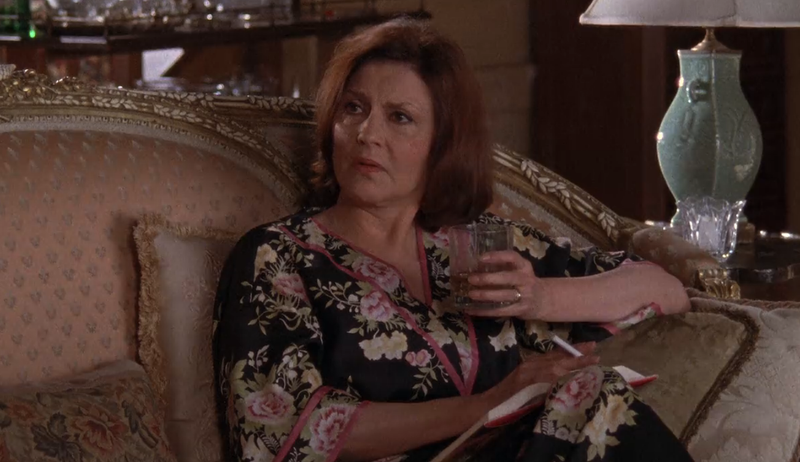 The role reversal of mother and daughter, with Emily smoking and drinking and Lorelai demanding that she put on some clothes, only to be greeted with an adolescent eyeroll, is spectacular. It’s only heightened by the anguish of Edward Herrmann (another consummate pro) as Richard, who falls apart completely, this time without Emily to pull him back together. The quick dissolve of her family clues Lorelai and the rest of us in as to how much Emily and Richard rely on each other, and how absolutely rudderless they are without each other, even if they’re reduced to bickering about Beatles. The relationship between Rory and Richard has always been a special one, and never better than in this episode, when she ties his tie and helps pull him together for the funeral. Richard can fall apart in front of Emily, Digger, and Lorelai, but for Rory, he knows he needs to make the effort. It’s a really lovely scene, taking us back to the time he took her golfing all the way back in episode three, when he first began to realize how much his relationship with his granddaughter could mean to him. Richard and Emily somewhat reconcile thanks to the banishing of Trix’s ashes at the end of this episode, but we know the worst is yet to come. It’s almost a disappointment to see Emily back to her buttoned-up self, criticizing Lorelai’s shoes. How much more fun would it have been to see Lorelai at a wild, boozy book club with her mother! It was a weird window into Emily’s internal life, but a very welcome one, and a showcase for Kelly Bishop to show us all why she’s a Tony-award-winning actress. Whatever happens after these two episodes, we will always know the considerable spark and mania that Emily has inside her. And this is where Lorelai’s hair gets ginormous for the rest of the season. I suspect extensions. Gilmore outfits: I like that the show is highlighting Lorelai’s money troubles by having her actually repeat some clothing, like that black-and-red argyle vest. This week in Gilmore entitlement: “People of means see what they want and simply take it, regardless of others!” “You pour your own coffee. You’re not supposed to do that.” Also, Lorelai hooking up her laptop modem line (anyone remember days before wifi?) in the most inconvenient place in Luke’s diner is just so typical of her. This week in Digger is the worst: He is unable to offer emotional support to his partner and secret girlfriend because he can’t handle funerals. Kirk + dogs = awesome. I would take non-Snuggles home in a heartbeat. Mrs. Kim continues to break hearts with her ousting of Lane from her home, but Lane’s joy at the band boys clearing a shelf for her in the new apartment goes a long way to make up for it. Much as I love Kelly Bishop’s Emily Gilmore, I may love her turn on Amy Sherman-Palladino’s followup series, Bunheads, even more. Probably because it’s more in line with Bishop’s own past as a Broadway dancer, one of the original cast members of A Chorus Line. The Dean subplot picks up a bit here with Lindsey’s only goal of trying to become a housewife and Dean hiding out in the arcade to stay away from her and her obtrusive parents. I would have more sympathy if getting married out of high school on the rebound wasn’t about the stupidest thing anyone could do.